The 21st century will witness the collision of two powerful forces -- burgeoning population growth, together with a changing climate. 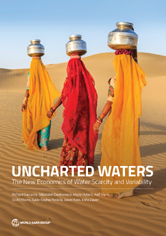 With population growth, water scarcity will proliferate to new areas across the globe. And with climate change, rainfall will become more fickle, with longer and deeper periods of droughts and deluges. This report presents new evidence to advance understanding on how rainfall shocks coupled with water scarcity, impacts farms, firms, and families. What Can Be Done to Prevent Rainfall Shocks from Becoming Destiny? Water Shocks in the Cities: Drowned or Dehydrated?